Dame Elizabeth Esteve-Coll, the former Vice-Chancellor of University of East Anglia (UEA) and former Director of the V&A Museum has played an integral part in the success of the Sainsbury Institute serving as a Trustee since the Institute’s humble beginnings in 1999 when, as she said, ‘the organization was just a two women team.’ In this third instalment she discusses with Professor Nicole Coolidge Rousmaniere, the Founding Director and presently the Research Director of the Sainsbury Institute, what she considers were the Institute’s most memorable projects as well as her views on the Institute’s vast network of supporters, past, present and future, and what she would like to see the Institute accomplish in the next decade. Dame Elizabeth confesses that it is very difficult for her to pick which of SISJAC’s events are the most memorable because she feels the institute has been remarkably successful in all of its exhibitions, events, and lectures. However, for her, three exhibitions Sharaku and Other Hidden Japanese Masterworks from the Land of NAUSICAA (Tokyo Metropolitan Edo-Tokyo Museum, 2009), Crafting Beauty in Modern Japan (The British Museum, 2007), and The Power of Dogu: Ceramic Figures from Ancient Japan (The British Museum, 2009) were particularly striking. 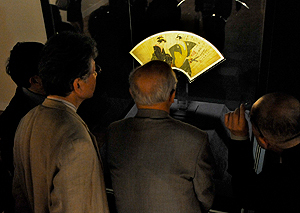 Sharaku and other Hidden Japanese Masterworks from the Land of NAUSICAA featured an extremely rare painting by Tōshūsai Sharaku in the collection of the Museum of Asian Art in Corfu and exhibited in the Tokyo Metropolitan Edo-Tokyo Museum in 2009. Sharaku is arguably the most famous Japanese artist whose paintings are almost all lost. While a number of his woodblock prints survive, there are only two known paintings by the artist left in the world. One is held in a private collection in Japan and the other, which was in recent years discovered by a team of scholars led by Professor Kobayashi Tadashi with Professor Nicole Rousmaniere, is housed in Corfu. 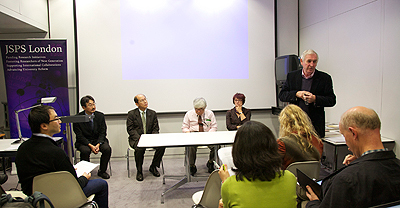 The discovery was such that the exhibition in Tokyo, sponsored by the Yomiuri Newspaper, received major media coverage including a special television programme created and broadcast by NHK (Japan Broadcasting Corporation). The exhibition Crafting Beauty, another of Dame Elizabeth’s favourites, was held at the British Museum and curated by Prof. Rousmaniere in 2007. Dame Elizabeth recalls that even Neil MacGregor, the Director of the British Museum, was hesitant about the exhibition at first but later told staff that it had been a ‘great success’! Officially titled, Crafting Beauty in Modern Japan: Celebrating 50 Years of the Japan Arts Crafts Association this exhibition sought to showcase the most beautiful Japanese art crafts produced during the past fifty years including textiles, metal, lacquer, wood, ceramics, bamboo, dolls and glass. 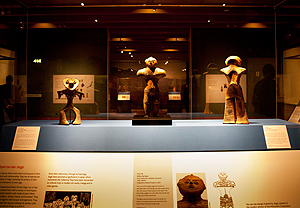 The Power of Dogū, the third exhibition that was highlighted by Dame Elizabeth, was held at the British Museum in 2009 and featured 67 dogū, abstract clay figures with recognizably human or animal features, lent by many different public and private institutions and individuals in Japan. Dogū evolved within the earliest dated continuous tradition of pottery manufacture in the world, stretching back to around 12,500 BC. The Robert and Lisa Sainsbury collection includes a few of these rare, extraordinary objects which, as a result of this exhibition, were highlighted in a separate exhibition, Unearthed, held at the Sainsbury Centre for Visual Arts in 2010. Dame Elizabeth argues that this British Museum exhibition, like the previous two, brought an aspect of Japanese culture to the attention of the museum going public in the UK that was largely unknown, except by experts. Dame Elizabeth went to on to explain that there were four areas with room for pivotal development: South Asia, The Institute’s Friends group, the Institute’s Website and relationship with the UEA. She hopes that the Sainsbury Institute will begin to work with Asian art historians from a much wider range of countries than it does now, particularly with those from South Asia. She believes that the Friends of the Institute group will continue to grow and could become extremely influential as a source of support, fresh ideas, networking and outreach. Additionally, she feels that the Internet is now so well structured and accessible that it will be possible to develop multiple kinds of web based activities. She believes stronger relationships with the University and in particular with Japanese studies would be beneficial for all involved and essential for future development of the field in the UK. Lastly, she foresees the University of East Anglia using the Institute’s presence in the city centre to their advantage, particularly as a boost for its regional reputation, research, and public outreach. She hopes that the Sainsbury Institute will continue to develop research projects and its collaborations with great museums, universities and scholars of all levels around the world. Unlike many other universities who have chosen to pursue Chinese language and cultural studies, the University of East Anglia is instead focusing its attention on Japan by establishing lectureships to teach Japanese language and also Japanese cultural heritage. Dame Elizabeth feels this is in no small measure due to the success of the Sainsbury Institute. Dame Elizabeth has been associated with the Sainsbury Institute for the Study of Japanese Arts and Cultures from the Institute’s very conception to the present day and she has played a pivotal role in its growth. It has been incredibly rewarding to discuss with her how she views the Institute – past, present and future.